Subscribe here on iTunes, Stitcher Radio or Google Play. You can also subscribe through the side bar icons. Don’t have a smart phone? No problem. Episode 085 – Are You Being You? – With one of the most central questions you can ever ask yourself, this podcast explores the social and emotional constructs that keep us from living our true self. Episode 084 – Did You Buy That? – Let’s a look at separating our ideas, desires and intentions from those placed upon us. Have you taken time to discover how frequent messages, close relationships and familiar atmospheres may have clouded you? You may be assuming that you authored your own ideas when, in fact, someone else gave them to you! This podcast provides you with self-awareness and self-empowerment to help you separate your own ideas from those conveyed to you by others! Then, listen to Lila Zizoula from the American Farm School in Thessaloniki, Greece, as she shares what makes her happy from the inside out, too. Episode 083 – Declaration of Independence – Are you the embodiment of the Declaration of Independence? The official document announcing a free and independent people would eventually form the foundation of the U.S. Constitution. Find out what the Declaration of Independence has to do with happiness – and how you can apply that document’s intent to your personal life today. This podcast contains empowering content with a governmental angle. Then, listen to mentor and coach Kristie Kennedy as she shares what makes her happy from the inside out. Episode 082 – Recognizing Love – In this podcast inspired by the holiday season, I explore what universal love feels like so that you might recognize it, too. I share some of my earliest recognitions of this kind of love, explaining how it manifests and what it feels like when we’re on the receiving end of it. You’ll be inspired to connect with this kind of love and possibly become a source of extending it to others. Episode 081 – Incognito – Have you been walking around incognito, concealing your true colors and real identity from everyone — including yourself? This Living Happy – Inside Out podcast provides empowering content that will encourage you to step to the forefront, even if just a little bit. Then, listen in to Elizabeth MacDonald as she shares what makes her happy from the inside out, too. Episode 080 – The Land of Possibilities – Do you know you can author your own possibilities in life? We begin with the meaning of the word possibility and then explore how your mind’s views of possibilities reflect back to you in experience. Powerful self-help for anyone who wants to gain access and control over their thought life and break through into new arenas of empowerment, creativity and more. Then listen to today’s guest from Israel as he shares what makes him happy in life from the inside out, too. Episode 079 – The Power of Memories – What are you doing with childhood memories – then – as well as now? Referencing a seminal article entitled “5 Things Your Kids Will Remember About You” released earlier this year by the Pantheos website, I explore the power of memories and how we can become architects of new ones today. You don’t need to be a parent to appreciate the sense of meaning and influence this podcast will convey. You can become the power of memories that can change the lives of others.Then listen to Connie Bowman, author of Back to Happy, as she shares what makes her happy in life from the inside out, too. Episode 078 – You as Ambassador – Do you realize that you – yes, you – are an ambassador? You don’t need an official diplomatic title to become a person of influence. This is powerful and inspiring content to help you gain awareness of your voice, ideas and ideals. This is also empowering information for you about the stature and presence you can carry as you choose to intentionally activate those ideals. Next, listen to Brent Price, Lifestyle Income Show expert from Australia, who shares what makes him happy from the inside out, too. Episode 077 – Seeing with Eyes Closed – An exploration of what we gain as we see things without our natural sight. In this podcast, I share how enhanced perspectives and freedom arise when traditional eyesight is removed. Helpful and inspiring content for anyone who needs a more liberated outlook. Then listen to Guy Djoken, Executive Director of UNESCO Center for Peace share what makes him happy in life from the inside out, too. Episode 076 – Who Made You King? – Have you ever heard the old adage, “Who died and made you king?” A light-hearted look at how we can either overstep our own authority or unwittingly fall under someone else’s, even if neither party was ever officially appointed “king”! If you are seeking happiness that stems from a healthy view of your own worth and boundaries — as well as those of others — this is an enlightening bit of self-help conversation. Then listen in to Sithara Reddy from southern California as she shares with us what makes her happy in life from the inside out, too. Episode 075 – What’s The proof? – Where do you go for “proof” in life and just what kind of proof are you looking for? An introspective conversation designed for those who are seeking human advancement and genuine leadership apart from labels, titles, etc. Tune in for this empowering self-help discussion to help you discover and discern people from a different perspective in both life and society. Episode 074 – Are You Grounded? – Hearing the words, “You’re grounded,” often conjures up negative ideas about punishment, confinement and separation. But what if something so seemingly negative in life can actually work to our advantage? An inspiring look at what can be gained for our good — if we have the eyes and perception to see things anew. Then listen to Elena Zhukova from Nikolaev, Ukraine as she shares what makes her happy from the inside out, too. Episode 073 – Looking in the Mirror – Can you look at yourself in the mirror? We’re not focusing on vanity here or the way in which you might appear in your clothing. Instead, we’re taking a “look” at the eyes in the mirror that are peering back at you! Some thought-provoking conversation that will inspire you to look into your own mirror and see beyond the superficiality and into your more wholesome identity. Expect a more glorious and authentic “you” to smile back in return. Episode 072 – Are You Judging? – Life presents opportunities for us to judge and be judged all the time. But is there a better and happier way to do it? A look at judging and condemning others v. discovering the better one that resides in all of us. A powerful, self-help concept that can improve the way you feel while helping others step up to their higher self. Listen and consider a different perspective to the age-old practice of condemnation and expect some happier outcomes. Episode 071 – Believing Every Authority? – Do you always believe what the authorities tell you? You may not be aware of how frequently — and sometimes blindly – we accept the words or advice from others without questioning the veracity or intentions of their proclamations and expertise. Listen to three unique stories and hear several perspectives on what happens when we believe every authority. See how automatically believing every authority doesn’t always help us. This is empowering self-help for anyone on a path toward personal peace and happiness. Episode 070 – The Song of Your Life – What is the song of your life? We all have one, even if we can’t carry a tune. We all have a private song that hums within us and serves as a mental backdrop to our life expectation and experiences. After listening to a story about writing the lyrics to a song from my junior high years, you’ll be inspired and empowered to discover, evaluate and possibly choose a new song of your own. Episode 069 – What Enlivens You? – How would you describe – and find – what constitutes an enlivened day for you? Most of us try to find happiness through activities driven by social norms, familiar patterns and even our intellect. But what happens when we seek to engage and interact with what enlivens us on a different level? A cellular level? I share my own experience with several activities that bring a sense of life to me so that you can be inspired to discover what enlivens you, too. 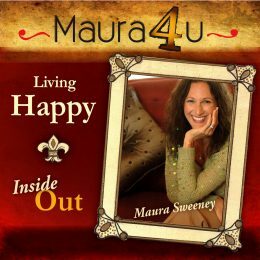 Happiness and vitality truly does come from the inside out, so enjoy this inspiring self-help podcast. Episode 068 – Mental Vacation – Is it time for you to take a mental vacation? Listen to a recent story of how “going dark” following a bout of food poisoning caused me to realize just how much of life is filled with negative news, fearful thoughts and often unnecessary stress. Get inspiration to unplug and find space for an empowering and refreshing mental break. Change our outlook, uplift your energy and improve your sense of happiness and well-being. Episode 067 – What’s in Your Well? – Encountering a centuries-old well in Europe brought forth this latest reflective question. You might be reminded of Capitol One’s famous slogan, “What’s In Your Wallet?” as we turn a phrase here and invite some introspection. Listen in to what’s designed to inspire you to see beyond the material. Discover a different source of wealth that’s been hiding in your own life well. Episode 066 – Pick Your Glasses – My encounter with a clever mural in the city of Mostar, Bosnia provides an impactful way for me to share how “picking our glasses” makes a big difference in our life experience. If you’re somehow stuck in life and seeking a pleasant change of outlook, listen in. You’ll be empowered and inspired to pick a new pair of glasses and expect to see a new and better view ahead of you. Episode 065 – House of the Happy Man – My visit to a Renaissance era stone house in Croatia provides a great backdrop to discuss more than just this famed House of the Happy Man. It allows me to talk about how the thoughts and intents of our heart can create a broad and lasting legacy toward living happy from the inside out. An inspiring and thoughtful way to consider creating your own happy house. Episode 064 – Crusher or Catalyst – Are you currently experiencing a life crusher – or a life catalyst? If you’re experiencing loss, disappointment, frustration or any other daunting challenge, how are you processing? A look at the way these challenges can either crush us in life or provide a powerful catalyst to move us upward, onward and to a more powerful state. An empowering way to reassess where you are and help you see your current challenge as a pathway to greater happiness in life. Episode 063 – What’s Your Venue? – Are you doing what you want but in the wrong place? A look at how venues we gather in can either support and uplift us or marginalize and overlook our talents and presence. If you’ve never heard Katie Couric’s back story about starting out her career at CNN, don’t miss this excellent example and more. An inspiring and insightful self-help podcast demonstrating how venues can make a difference when we’re desiring to live happy from the inside out. Episode 062 – Only You Can Do It – Are you watching the world pass by or taking it boldly the horns and becoming a force yourself? It is in the “doing” of life that we find our strength, purpose and joy. Some reflections on what keeps us in a spectator mode and the benefits that take place when we step out on our own. Want to become one who “does” life rather than “watches” it? Here’s an encouragement to find what is within you so you can live according to the yearnings of your soul. Be inspired and get happier by remembering: Only You Can Do It! Episode 061 – Ageism – Are you measuring your age by calendar years and birthdays or by the patterns of thought you’ve acquired inside your head? Some reflections about how each of us can get “stuck” in our own generation and how we might un-do those thought processes to emerge more flexible, happier and free. Ideas to inspire you toward living more happily and free – and more youthfully, too! Episode 060 – Where is Your Ship Headed? – Giant ships are directed and controlled by a small and often unseen rudder that is hidden below sea. If your life were to be directed by a rudder of your choosing, what would it be and how would you use it to get to your desired destination? An inspirational and empowering podcast that will get you thinking about heading toward your destination in life! Episode 059- Addicted to Stress – Maybe you don’t know it! Stress is everywhere around us. A look at how familiar environments affect us and a discussion about how to change your atmosphere and your world. A self-help quote from Gandhi will empower and inspire you to greater peace and happiness – from the inside out. Episode 058 – Mocking Monica Lewinsky – Inspired by a March 2015 NY Times Feature Article. Is there a mocker in you? A look at the aftermath of life for Bill Clinton’s former intern and sexual dalliance. What were the emotional effects for Monica and also for those who contributed to her mocking? Fascinating and empowering self-help content for anyone who wants to lighten their own guilt load and bolster their own happiness. Episode 057 – The Kidult in You – It may be time to bring it out! A Kellogg cereal campaign calling on Baby Boomers and GenX’ers to buy Frosted Mini Wheats provided the perfect segue to talk about kidults. Explore the possibilities of living happier from the inside out. Grow into adulthood, but rediscover and keep the kid within you. Inspiring self-help for you to enjoy all that life offers you today! Episode 056 – Wrong Shoes – I’m not talking about your physical shoes but, rather, your “walk in life.” Are you living and walking in accordance with your interests and personal essence? An analogous look at our walk in life through the lens of two familiar fairy tales: Goldilocks and Cinderella. Inspiring self-empowerment designed to help you more comfortably walk out your truer identity. Episode 055 – Minimalist or Purist? – What’s the difference between being a minimalist and a purist? If you’re looking for a way to harmonize with your passions and interests, listen to a discussion about how purism can help reflect your true essence. Thoughtful content designed to simplify your life while providing room for increase and abundance. Self-empowerment and self-help content to help you find greater happiness from the inside out. Episode 054 – Accepting Invitations – We’re not talking here about responding to traditional Hallmark invitations to birthday or engagement parties. Instead, we’re tackling the subject of answering life invitations to strife, debates, problems or any other insecurity that does not serve our best interest. Listen to some invitations I’ve declined; then consider some of your own. Self-help and self-empowerment. Peace and greater happiness await you – from the inside out. Episode 053 – Are You a Leader? – Did you know that there is a leader in you? Incorporating a quote from leadership John C. Maxwell, this podcast focuses on the capacity we have to influence the lives of others. If you have yet to discover the leader in you, get ready for inspiration. Listen here for self-help information that will inspire you on your way to empowerment and increased happiness. Episode 052 – What Do You Have? – Have you been concentrating on what you don’t have – or what you do? With a personal story as well as a great quote from Oprah Winfrey, learn how whether we concentrate on the former or the latter determines our experience with abundance or lack. Want more happiness? Remember what you have right now! Inspirational self-help for you and your happiness. Episode 051 – Do You Know the Way? – Have you wondered if you knew the way to happiness and peace in life? If you’ve ever felt like you were walking a lonely, uncertain road, tune in to this uplifting reflection. With references to Dionne Warwick’s popular 1960s hit Do You Know the Way to San Jose and a brief story of my own journey, you’ll find inspiration as you travel your own path back home to happiness and inner peace. Episode 050 – Sun is Shining – Do you view your circumstances from ground level or from up above the clouds? A reflective piece about flying high above the clouds in the sunshine before descending into the rainy and cloudy weather of London, England. Listen in to this life analogy and see how thoughts determine our frame of mind. If you’re not seeing the sunshine in your circumstances, this podcast is for you! A brighter, happier and more joyful spirit can be yours – if you are willing to remember that the sun is always shining. Episode 049 – Life is a Choice – Life at any age is a choice and only we can choose to live it. A discussion about getting stuck in what we believe was a previously experienced high point: high school, college, marriage, career, etc. Believing that a past era was our finest can preclude us from living anew today. Listen to inspiring self-help content that will get you hopeful about living fully and in the now today – and every day of life. Episode 048 – Black History – In a famous quote, actor Morgan Freeman claims Black History is American History. A look at the celebratory month from a more unified perspective with special attribution to Tampa Bay Times columnist and bureau chief Ernest Hooper who shares some of his own twists on the subject. Thought provoking, expansive and uplifting content for those who view the United States as creating all men equal. Inspiring self-help for people of any race who desire to see beyond the surface and into the common soul. Episode 047 – Valentine’s Day – How are you planning to spend the most romantic day of the calendar year? A look at the origins and development of the holiday and how you can use the date to convey love to others in both traditional and non-traditional ways. Inspiration, mindfulness and self-help for those living outside the box. Episode 046 – Afraid of Falling? – There are many ways we can fall in life. How we relate to our falls often determines the level of freedom and joy we carry in life. Join me as I share a childhood tale of falling and see if you can’t relate. Self-help and mindfulness to broaden your happiness horizons. Episode 045 – Are You a Truth Magnet? – Looking for a brighter day and existence? Imagine carrying such an intention where the very source of rest, peace and stability finds its way through – and to – you! Listen in and be inspired to open up your mental and emotional barriers. Let the light and joy of Truth to join up with you. Self-help and mindfulness designed to add to your happiness quotient. Episode 044 – Are You Good News? – When people see you coming their way, what do they anticipate? The answer to this question is powerful when seeking to live happily from the inside out. We may not realize how our mind, our presence and our very intents “broadcast” to others just like a newspaper. Powerful self-help and mindfulness for you! Episode 043 – What Are You Thinking? – The answer provides a giant key to increasing your happiness! I’m not speaking about your next meal or what you want to watch on TV. Instead, I’m talking about the subtle thoughts that form the backdrop of our lives. Listen to me share two personal stories about how acquired thoughts – and especially fears – can suppress and stifle our ability to enjoy a life of freedom. Self-Help and Mindfulness for you! Episode 042 – Saying Goodbye – Don’t imagine familiar names and faces here! I’m referring, instead, to unwelcome friends of a more subtle type that unknowingly invade our lives and steal our happiness. Listen to a personal story. Then say good-bye to your own concepts, ideas and other unwelcome beliefs that have masqueraded as your friends for too long. Self-help for your peace and happiness. Episode 041 – Shining Your Light? – If you’ve ever admired twinkling lights around the Christmas holiday season and were mesmerized by the brightness emanating from within, then listen to this podcast relate those lights to you. Nothing can be more brilliant, beautiful and inspiring than when you shine from within and let the world “see” your brilliance. A parable for your soul to remember your true spiritual nature. Increase your happiness and bring joy to the rest of the world, too. Episode 040 – How Big Are You? – Are you living in your truest, biggest self or are you still conforming and confining yourself to environmental and societal smallness? With references to Dr. William D. Anton who authored a leadership book for CEO’s, a look at why we reduce ourselves to a smaller scale. Self-help, and inspiration to expand your vistas beyond those self-imposed boundaries. Be big and be happy. Episode 039 – Are You Mature? – Are you mature enough to learn from anyone, anywhere and at any time? My experience demonstrates how lessons in personal growth can arise from of the most surprising, and sometimes embarrassing, sources! If you’re seeking peace in your life and really want to reach your highest self, this podcast is worth a listen! Episode 038 – Buried Treasure – Has a hunt for treasure been inserted into your personal DNA? Mel Fisher and his son Kim, featured on the Discovery Channel, unearthed a fortune from a centuries-old Spanish ship that sunk off the coast of Key West, Florida. Inspiration, encouragement and a look at what makes us quest for our own personal treasure, too. Episode 037 – Cheering Others On? – Is it easy and natural for you to cheer for others in life? Find out how and why it’s important to make room to celebrate the gifts, talents and accomplishments of others. Self-help that leads to your own sense of abundance while contributing to a more positive world. Episode 036 – Do We Really Know? – A Smithsonian documentary on JFK’s final day serves as an excellent starting point for asking the question: Do we really know . . . or just think we do? Explore the ways in which we choose to include and exclude facts and information based upon our biases and opinions. Self-help to explore your belief system and your willingness – or not – to allow all the facts and information into it. Episode 035 – Living in Jet Set Time – This podcast asks whether you are launching out on your dreams today or waiting for an elusive tomorrow. Inspired by the Smithsonian channel’s documentary chronicling 1960s jet set stewardesses and their pioneering role during a time of cultural and technological change, it provides an excellent backdrop for the question. Inspiration and self-help for you to explore and pursue your pioneering and leadership dreams. Episode 034 – Staying in Your Lane – In our path to becoming a better person, are we staying in our own life lane or minding everyone else in theirs? A lighthearted look at turning pesky issues back to where they belong: in our own car and in our own mind! Listen to some self-help reflections to inspire you to add peace and happiness to your own life. Episode 033 – Do You Believe That? – There is often a divide between things you’ve been taught or what society has established as “fact” and what is your true reality. A challenging look at the world as it’s been presented and sold to you and the one that’s still waiting to be rediscovered. Inspiring content for leaders and world changers, as well as those trapped in comfort zones, fear and isolation. Episode 032 – Life or Death? – Does the specter of Death or the vitality of Life inspire and magnetize you? This bold and compelling question will help you reflect upon your focus and consider your relationship with others. Listen to a message that will inspire you to become a powerful force today, while people are still around to hear your words. Episode 031 – What is Your Name? – Joel Osteen’s message caused my friend to exclaim: “Maura, you have reversed the meaning of your name!” If you have yet to investigate the origin and meaning of your name, this podcast is a must. Tune in to this empowering and transformative message that inspires you to establish your own identity through your own spirit, mind and will. Episode 030 – Critic or Contributor? – The answer to this question reveals much about your philosophy on life and whether you see yourself as a weak or empowered individual. Listen to my “aha” moment on the subject and gain some self-help advice. Episode 029 – Are You Living Large? – Most of us limit the idea of “living large” to the purchasing power of our wallets. Listen to the story of one influential friend of mine whose very essence spoke of living large. Inspiration and spirituality for those who see beyond the money. Episode 028 – What is Your Culture? – I’m not inquiring about your ethnic roots. Instead, I’m talking about the culture of excellence you can create and share with others. You can create, develop and disseminate your own brand of culture that speaks uniquely for you. Inspiration and self-help for those interested in becoming more influential in life. Episode 027 – What is Your Legacy? – Think that your life is insignificant? Think again. Your legacy is one of your most powerful living messages, plus something that can live on even after you’re gone. Listen as I share stories of two completely different individuals whose lives breathed the word “legacy” as they lived out their personal philosophies and spirituality. Episode 026 – Sun Setting or Rising? – Do you believe your “moment in time” has passed or that your proverbial sun has already set? Have you been carrying a limiting personal philosophy and a hopeless sense of spirituality? Consider that there’s a new sun rising right in front of you, maybe even today. Listen and be inspired. It may change the way you view time, circumstance and a whole lot more. Episode 025 – Why Get a Hobby? – An NPR poll on what people do to “de-stress” their lives reveals some top results. Challenge your philosophy, fuel your personal spirituality and discover why getting out and getting a hobby can help improve your happiness and well-being, too. Episode 024 – Cross or Cause? – The way you view your current challenge or situation will help determine whether it advances – or stymies – you in life. Listen along to evaluate your own belief system and refine your personal philosophy on the subject. Self-help designed to empower you today. Episode 023 – Unified or Fractured? – Do you reveal mere slivers of your personal identity to others – and hide the rest? Is it possible to become more peaceful by re-examining a social philosophy that currently hides and divides you? Listen to my personal story for some self-help thoughts. They could lead you toward becoming a more unified personality, too. Episode 022 – Black or White World? – Does your personal philosophy require you to always take sides? Can you increase your sense of peace and well-being when the next opportunity arises to choose arguments, or even enemies? Listen to this self-help tip and consider the topic from a fresh, new perspective. Episode 021 – Speed Bumps in Life – Have you been inhibited from advancing in life because someone else impeded your path? Take a look at what fuels – and foils – our personal growth and potential. Self-help for those wanting to accelerate on the road toward a satisfying and happy life. Change your philosophy and super-charge your way to purposeful living. Episode 020 – Your Way? – Is your philosophy requiring you to always be right? Just how open-minded are you to new ideas? A look at how clever we think we are, plus some self-help thoughts on how we might become even brighter. Listen to find out. Episode 019 – Are You Asleep? – Most of us are asleep, but not the way we imagine. Here’s a look at how you, too, can shake yourself from slumber and awaken to more of life. Some inspiration and self-help for those who might not even be aware they’ve been napping. Episode 018 – Are You Engaged? – I’m introducing the subject with diamond rings and thoughts of marriage, but there’s lots of personal philosophy and spirituality to be explored behind the idea of engagement. What were – and are – you hoping for in your future? How can you engage your thoughts and behaviors toward those ends? Listen and be inspired. Episode 017 – Who Says You Can’t? – A philosophy bound by “I can’t” can end up defining – and even dominating – our life. Listen to some of my experiences on exchanging an “I can’t” mentality into one that says “I can”. Discover how you, too, can exchange that limiting and negative mantra for something better. Self-help aimed at having you marvel at where your personal “I can” philosophy might take you! Episode 016 – Why Do We Implode? – What makes some of us collapse and self-destruct? Listen to some thoughts on the topic – with an eye toward creating the opposite experience. A self-help challenge to define and live according to your own healthy philosophy on life. Episode 015 – Leading with Freedom – Many of us have been counted among the marginalized, the oppressed or the underdogs. When finally freed to express ourselves, will we arise into better standards and leaders? Tune in to hear my philosophy about the good, the bad and what can be the better in life. Episode 014 – Blaming or Offering Benefit? – Being a blamer or a provider of benefits is often a function of our philosophy about ourselves and the place we hold in the world. Listen to find out why it’s never too late to see ourselves from a generous-sized perspective. Episode 013 – What is Your Focus? – Are you focusing on problems and limitations, or possibilities and freedoms? Listen to a few thoughts that explore how what we focus on in life impacts our outlook and our experience. A self-help challenge for anyone desiring to escape from a myopic funk. Episode 012 – Parked in Comfort Zone? – Our thoughts and fears can keep us parked in the comfort zone rather than venturing out to explore new territory in life. If you think you may be missing out on greater growth and happiness, listen in and get your motor in gear. Inspiring self-help for the timid. Episode 011 – Your Goal in Life? – Discovering and defining your goal in life is far more powerful and profound than attacking ordinary “to do” lists. Answer this question and unlock a whole new dimension of spiritual and practical joy in your life. Some inspiration and self-help on the topic. Episode 010 – What is Your Identity? – What, exactly, is your identity? Discover some of the meanings of identity that will enlighten your spirituality and help refine your personal philosophy. Once you listen in to this self-help for the soul, you’ll view your identity in a powerful new way. Episode 009 – What Are You Good At? – Everyone is good at something, but we often overlook our obvious talents. Listen to these inspiring thoughts about the benefits of following a self-help path toward growth, creativity and personal success. Episode 008 – Turning Dreams into Reality – What special dreams did you once cherish, but ended up storing inside a box? Maybe it’s time for you to reopen those forgotten aspirations and bring your hidden dreams to light. Change your philosophy on limitations and be inspired by this self-help challenge. Episode 007 – What Are You Wearing? – It’s not all about the shoes, the jewelry or the outfit you just bought at the mall. Listen and learn about how you “wear” far more than the clothes on your back. You wear a life philosophy, too. Episode 006 – Power of Forgiveness – Are you willing to forgive? What is your philosophy on extending grace to others and yourself? If you haven’t discovered the amazing power of forgiveness and the benefits it offers, listen in. You’ll be glad you did! Episode 005 – Unwelcome Friends? – Don’t let the title fool you. “Unwelcome friends” unknowingly enter our lives and drain the life out of us. Find out who these “friends” are and where they come from. Then take this self-help challenge and bid them good-bye. Episode 004 – I’m So Proud of You – When is the last time you heard this expression? Listen and empower yourself and others with this self-help suggestion. You’ll find that life affords plenty of opportunities to celebrate yourself and others in ways you’ve never imagined. Episode 003 – How Do You See? – Do you see yourself as a victim or a beneficiary? The answer reveals a foundation stone of your personal spirituality and philosophy about life. Find out the enormous implications of how your mind processes your life experience based upon your response to this one simple question. Episode 002 – What’s Wrong with Truth? – Openly admitting to a mistake I made as a corporate branch manager not only proved liberating to me, but also changed the atmosphere of our office. It allowed for growth and freedom among our staff. Can admitting to the truth emancipate you, too. Find out more about this valuable key to self-help. Episode 001 – You Were Built For? – A documentary featuring celebrity entertainer Michael Buble and a key quote from his life provided an excellent base for asking you this question, too. The most satisfying things we do in life spring from our center of spirituality. Listen and discover what you were built for, too. Episode 000 – Welcome – My frustration as a NJ lawyer-in-the-making motivated me to find happiness and authenticity in life. This podcast focuses on how my philosophy on finding happiness got its start. It serves as an ideal proving ground to share what I’ve learned with you, so that you, too, can find your own happiness and authenticity in life by following what you love from the inside out!